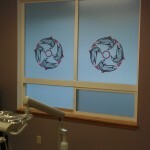 Nisqually�Tribal�Dental called us up, with some privacy needs for their patient exam rooms due to HIPPA laws. 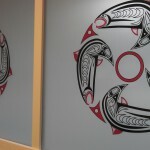 Not only did they want privacy, but a little design to coincide with the existing Pacific Northwest native American art. This type of art is amazing,�I have always loved seeing great art form in various settings. The Art was done and provided by Fred Croydon; Haida Point Art, (fredngale@wavecable.com�360-466-2266)�who is an amazing and�native American�artist. I believe he captures the true original beauty of the art from with a great modern look. 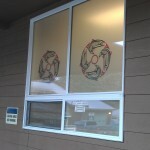 So this project was really fun to do for us;�Just a standard frost for privacy, But when it came to the graphic we were not quite sure the best way transfer the original art to something like a window and still�keep the detail and clarity. Vinyl can be a good solution… if you have a simple design. As you can see it has a lot of contours and detail not to mention two colors. So we knew this was a perfect time to use our technology to the full. Any design, lettering or multi colored logo, we can digitally print on to a clear or white specialized film. In this case clear was the best solution, again to maintain its original form. If you have any ideas for your home/office glass�or are interested in having window film applied be it privacy, solar control or even security film please call 800.404.3695 or visit abcsuncontrol.net.